Born: 23 December 1848, Peddie, Eastern Cape, South Africa. 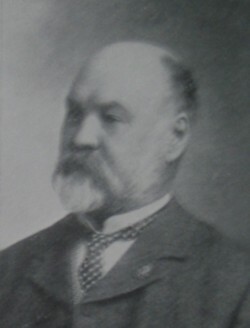 Arthur D. Webb, son of Frederick C. Webb, was a solicitor, notary public and conveyancer, with an interest in natural history and indigenous cultural artifacts. He was ecucated at Peddie, King William's Town, and Queenstown in the Eastern Cape. On 15 October 1873 he married Mary E. Bertram, with whom he had eight children. He practiced his profession in Queenstown from about 1870 to 1896. In that year he sent a list of "native curiosities", skins, horns, etc. to the State Museum in Pretoria, offering the items for sale. However, the museum's honorary director, Dr H.G. Breyer*, apppears not to have been interested in the materials, for he returned the list. Also in 1896 Webb offered premises in Queenstown for sale and subsequently resided in Bulawayo, Southern Rhodesia (now Zimbabwe). There he practiced under the name A.D. Webb & Co., and later A.D. Webb & Son, to at least 1911. In 1899 Webb became a foundation member of the Rhodesia Scientific Association, Bulawayo, serving on its council from the beginning to 1903, then as joint vice-president for 1903/4, as an ordinary member of council again for 1905/6, and as joint vice-president again for 1907/8. In January 1900 he exhibited a large collection of Coleoptera and other insects from the neighbourhood of Bulawayo before the Association, followed in February by a collection of grasses, in April by a collection of Ladybirds (family Coccinellidae) and other beetles with elongate antennae, and in July by "native curios". General directory of South Africa (Bulawayo), 1903, 1908, 1910, 1911. National Automated Archival Information Retrieval System (NAAIRS). . Documents relating to Webb, Arthur Davies / Webb, A.D.
Rhodesia Scientific Association, Proceedings, 1899-1908, Vol. 1-7.